Despite Google’s obstinacy on the matter, a whopping 63% of our readers made it clear in our July poll that they considered SD card support an important factor in deciding on smartphones. That’s a pretty large number of people, one which Dropbox is apparently happy to accommodate. 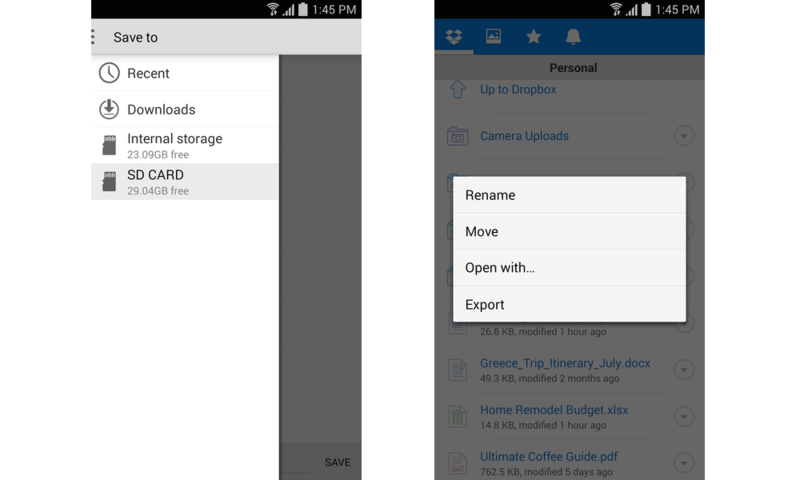 The company announced today an update that will bring an option to export files straight to SD cards. Migrating files to and from SD cards is as easy as tapping the “Quick Action” button, selecting “More,” “Export,” and then “Save to Device.” If the SD card doesn’t appear as a destination device, choosing the menu within the “Save to” screen, navigating to “Settings,” and selecting the “Display advanced devices” option should fix things. As if it were not rather obvious, the Dropbox team points out that SD cards are ideal for offline use. Travelers who frequent locales without reliable or affordable connections could certainly benefit, as can those with restrictive data caps. The update is rolling out to the Play Store today. Beta testers can download it now.